Among the legal issues that most perplex self-storage operators are those pertaining to big changes in tenant status, particularly divorce, death, disability and bankruptcy. 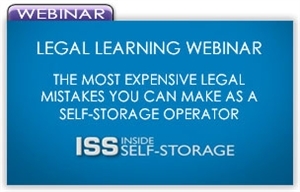 Members asking legal questions on the Self-Storage Talk online community have revealed that these quandaries continue to present hurdles to facility operators nationwide. How to handle the death of a tenant, including the people who want entry to the unit after it occurs. Questions to be answered include: Is a power of attorney effective and under what circumstances? What is an executor, administrator or commissioner in relation to the tenant's estate? Can a facility operator rely on the contents of the tenant's will? What to do in the event a tenant is disabled. Can you rely on the power of attorney or another document? What to do if your tenant gets divorced. Who gets entry to the unit? Who can remove items from the unit? How do you handle a conflict? The three chapters of bankruptcy and your rights as a facility operator under the relief from stay.